Home / BATHROOM REMODELING AND MAINTENANCE INFORMATION BLOG / How Does Lighting Affect the Mood of Your Bathroom? How Does Lighting Affect the Mood of Your Bathroom? People spend a great amount of time in their bathrooms. 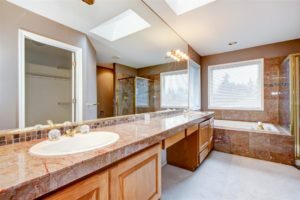 From showering and shaving to putting on makeup and relaxing in a nice bubble bath, people use their bathrooms almost as much as, if not more than, their kitchens. However, one major difference between the kitchen and the bathroom is the attention to detail people invest in choosing and selecting the right lighting to use in the bathroom. Proper lighting helps set the mood you want to feel, from a dimly lit room with candles and a tub full of hot water and bubbles you can sit in to relieve stress and tension, to a brightly lit room so you can make sure you get a close shave or properly apply makeup. One of the biggest trends in bathrooms is adding natural lighting by installing windows and sky lights. Allowing natural light into the bathroom not only helps refresh the look and ambiance within the room, but also can make smaller bathrooms appear much bigger. There is a wide variety of windows and skylights to choose from. Most offer privacy in the form of frosted glass to prevent people from seeing in the bathroom. You can instead opt for privacy shades you can pull up while still gaining some of the benefits of the natural light. Plus, you gain the health benefits of exposure to natural light because it helps set your mood for the day, as well as helps regulate your internal clock. Lighting is also important to help prevent accidents. Did you know that most accidents that occur in the bathroom are the result of improper lighting? In addition, most accidents involving the elderly are due to insufficient light levels. To help control the light levels within the bathroom, have dimmer switches installed to control specific light fixtures. Dimmers allow you to adjust the brightness of the bulbs and set it to your preferred level for the type of mood you want to create or the time of day or night. For example, before going to bed, adjust dimmers so light levels are low, but sufficient to see. This way, if you need to get up in the night and use the bathroom, you are not blinded when you turn on the bathroom lights. When selecting light fixtures for the bathroom, look for ones that will address specific needs. For instance, you may want to consider recessed LED lighting to put around a mirror to make shaving or putting makeup on easier. For overhead lighting, choose bulbs that simulate natural light. Do not forget to put lighting above bathroom enclosures, like showers and tubs. You should never put fluorescent lights in the bathroom, because they can make it feel more like a factory or office environment, and who wants to feel that way when they are at home? For bath and shower surrounds, enclosures, windows, and other accessories, contact American Bath Enterprises, Inc. at (888) 228-4925 today.